Now that you have the screen saver(s) here's some very interesting things you can do with them. Follow Steps 1 through 4 to adjust your settings. Be sure to read the notes at the end of this tutorial for possible problems you may encounter and how to remedy them. Step 1 First bring up the Settings Dialog Window by right-clicking on an empty area of your desktop and selecting properties from the pop-up menu. Or you can go to Control Panel, and choose Display. Step 2 Select the screen saver tab at the top. You will see a buton that says "settings" as shown below. Now Click that button. 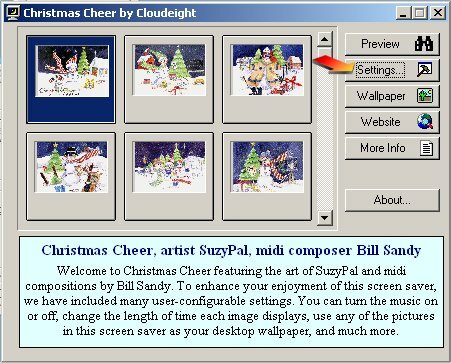 Under the screen saver tab you can set how long the screen saver waits before loading and how long to display each image for, as well as how the images are displayed. You can even set them for "artistic" black and white! To disable the sound simply remove the check mark next to "Use Sound Effects if Available". If you want to hear the sounds, just click in the white box next to "Use Sound Effects if Available" and place a check mark there. Under the wallpaper tab, you can use any image in the screen saver as desktop wallpaper and have it automatically change your wallpaper weekly, daily, even (for those of you who get bored easily) hourly! 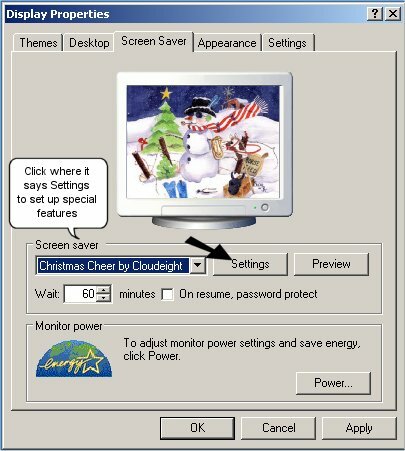 In the password section you can choose your own password and password protect your screen saver so that no one else can change your settings. The effects tab generates a dialog window in which you can change transition effects and the speed of the transitions. Please feel free to customize your new screen saver any way you like. Experiment with it and you'll find the just the right settings for your personal tastes! NOTE! 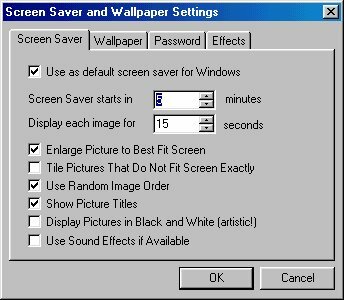 If you are using some kind of a screensaver manager, such as Webshots, it may interfere with your personal settings that you make. If you have a Wallpaper manager installed, it may interfere with your settings for using images as Wallpaper and/or rotating them. As we cannot control, or manage all the different programs a user may have on his system, if these features do not work for you, you will have to remove the managers you have set up. Each screen saver we build is very easy to install and uninstall. The installation program puts a link to the screen saver in your start menu along with an uninstaller.